Our first two months have been very good to us. While we still have many open appointments during the day, we are steadily increasing business. Running a nail salon is a new market area for me, so I'm learning not only what the peak hours and days are but also what products and services are in demand. It’s difficult to research everything before opening a business, especially since every business is a little different from the next. I'm also learning to let the business evolve along with the demand (services, products, and hours/days) in the area. With that said, Tickled Pink is evolving already. While we started out catering mainly to adult women, we are now catering to both adults and children. We discovered a demand in the area for young girl services (girls ages 4-12) — so our “Princess Menu” of services and our “Princess Spa Parties” were born. To that end, we've started participating in child-centric events in our area. For example, last week we participated in the Fall Festival at East Clayton Elementary School and in the Boo Bash at childcare center Screamin’ Mimi’s Kids’ Place. At both events we offered printed information, like Princess Spa Parties descriptions, monthly pedi specials for moms, price lists, and business cards, plus we provided a free service to the children who visited our booth, like polishing their nails and applying simple Halloween decals or other designs. This gave us the opportunity to promote the salon with the parents too. Plus, at the school event we donated candy for game prizes, a door prize for a raffle, and, at our booth, candy for kids and a door prize drawing for the moms. We’ve already started getting calls and appointments scheduled from these two events. We have another event scheduled tomorrow at East Garner Elementary, plus several more between now and the end of the year. For anyone looking to build their clientele I would strongly urge you to find out what events and activities are going on in your community. One thing I've learned from participating in these child-centric events is that the community loves to see their local businesses supporting events like these. And they are more likely to patronize your business if they know that you’re also supporting the community you’re doing business in. As for hours of operation: our community is getting used to the idea of Tickled Pink being an appointment-only salon. Clients are enjoying the fact that they are seen as soon as they walk through the door — as opposed to the possibility of waiting a half hour or more. Evenings and Saturdays have booked up so quickly that I've begun to interview more techs to help cover evening and weekend hours as my schedule is full now. 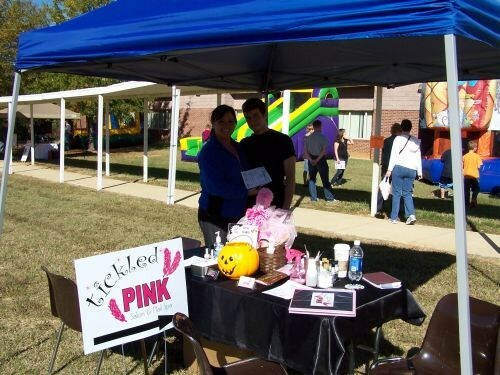 —Melodie, Tickled Pink Salon & Nail Spa, Clayton, N.C.
Photo: My oldest son, Anthony Little, and his girlfriend, Melissa Joseph, helped work Tickled Pink’s booth at the Fall Festival at East Clayton Elementary School.